In his last published work, The Three Ecologies, the influential psychoanalyst and cultural theorist, Felix Guattari, makes art an essential paradigmatic site for what he calls a new ecology of mind. For Guattari, the enemy is scientific rationalism and the way in which it configures itself in the information society. This has worked to dissolve human subjectivity, making us prey to the integrated system that is world capitalism. He further argues that as an essential counter-measure we must learn to abandon scientific paradigms and return to aesthetic ones. Life must become… like a performance, one must construct it, work at it, singularize it. Just as the best artists approach each new work in a spirit of adventure, we must also teach ourselves to reject overly deterministic, pseudo-scientific procedures in favour of more free-wheeling poetic ones. For Guattari, too, art is inescapably a first order, ‘hands-on’, material practice, and in the footnotes to The Three Ecologies he refers the reader to the writings of Francisco Varela who sees art as a form of auto-poiesis and therefore a part of the machinic order. 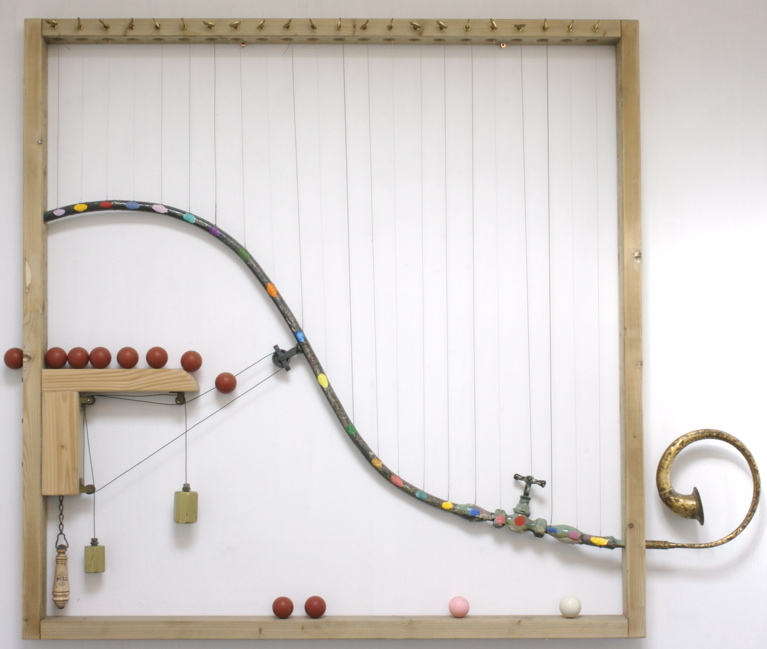 In this respect, Varela suggests, it demonstrates its own internal necessity – is, axiomatically, both ‘productive’ and ‘reproductive’ – its main purpose being that of wresting complex forms from chaotic material. Such a formulation might well have been written to describe the work of David Taborn. As a painter – and despite all of his heroic attempts to escape painting’s flatness over the years, a painter he stubbornly remains – there is no one who has cast painting more conspicuously and more joyously as a material practice. 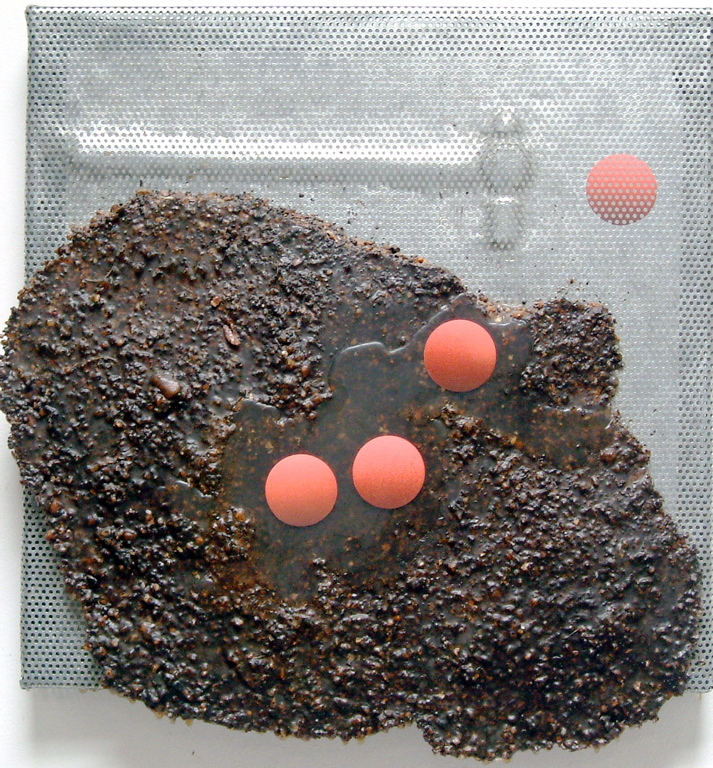 Taborn’s work employs an almost bewildering range of different substances, raw-materials, techniques and processes and it is this aspect of his work which first captures our attention. We are immediately caught up in the struggle that he wages with the object in order to bring all of this diverse range of material properties to heel. But it is the fact that he is able not only to tame these elements but also bring them firmly within a readable visual order of great complexity that makes his work so compelling and gives it a longer and much slower burn. 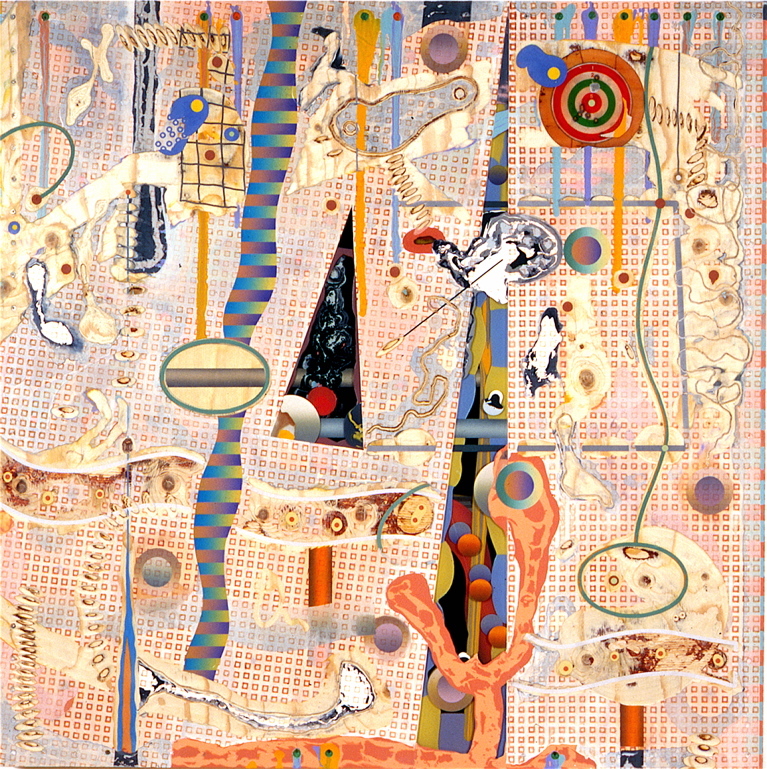 These are works which come to the eye quickly but live on in the imagination for a long time afterwards as lucid as well as highly complex visual organisms. And it is this linguistic complexity which gives a weightiness and a precarious (in the past I have used the word dangerous) stability to Taborn’s work. Some artists are attracted to pictorial complexity for neurotic reasons, others for some often quite mistaken notion of veracity, but there are also those who see complexity as a way through to a different kind of unity, in Guattarian terms, to a new kind of ‘singularity’. Taborn belongs to this last category. He is much wedded to the alchemical metaphor of the homunculus. The childlike figure who comes into existence out of sight of the Alchemist within the alchemical vessel and appears with all of its characteristics intact. This image fascinates Taborn, first of all because of the idea of (self) containment that such a hierurgy implies and secondly because it suggests a highly individuated process of ‘coming into being’. One which is driven from within the occurrence itself. The implications of the homunculus as a metaphoric model for the making of a painting are fascinating. The traditional idea of painterly containment in which everything is determined in relationship to the canvas edge… as a flattened topology, in other words… is suddenly transformed into a three-dimensional model. What is envisaged is a conceptually elliptical space or skin within which the elements that act together to form the image are endlessly moving and jostling with each other. Here animated complexity is, indeed, made to serve machinic principles as the image makes (produces) and continuously remakes (reproduces) itself in the eye and mind of the viewer. But the homunculus metaphor has even more startling consequences for the notion of style. Before modernity style was conceived as a horizontal, evolutionary principle occurring throughout the working life of an artist. It was legitimate then to speak of the life of an artist in terms of stylistic periods: early, middle and late, for example. As Roland Barthes pointed out in Writing Degree Zero, modernity changed this into a vertical system… a kind of shopping list. Style became a matter of choice. A writer could choose to write, a painter could choose to paint, in different styles, sometimes switching quite dramatically between works. By contrast the homunculus model radicalises the idea of style even further by removing from it any sense of a continuum (even a negative one). The stylistic character of each new work is the subject of an ongoing negotiation that becomes the inner life, the conceptual content – if you like – of the work itself. Taborn, when talking about his work, often uses the metaphor of the portrait. For him, individual works have individual characters; characters which have been acquired, ultimately, from within the making of the works themselves. But the metaphor also suggests a form of ‘doubling’ which is part of the homunculus model too: the idea that somehow the works have enjoyed some kind of prior state of existence. Alchemically speaking, the homunculus stands for the unity that underpins all ‘singularities’, in other words, it stands for the idea of unity per se. In the domain of language this would point to that phenomenologically indefinable aspect of Language, that aspect which makes all languages accessible (or translatable) to each other. By deploying this model, then, Taborn seems to be suggesting that while style can be rendered ephemeral – can even be abandoned as a legitimate artistic preoccupation – the underlying values that shape and give identity to the painting as a work of art must be rigorously adherend to, even foregrounded. The ‘doubling’, then, serves as a reiteration of values standing above and beyond superficial general characteristics as well as the peculiarities of individual works. Coming face to face with David Taborn’s work for the first time is an exciting and immediately enriching perceptual experience. As we have already remarked, these are works which trade quite unashamedly on a bewildering range of manual skills and technical expertise. In this respect they are stunningly effective. But they also demand and reward long and careful looking. They explore and hold up for scrutiny, a whole range of dualities that speak directly to contemporary consciousness. The natural versus the technical. The manual as opposed to the mechanistic. The will to order and the inevitable collapse into disorder. 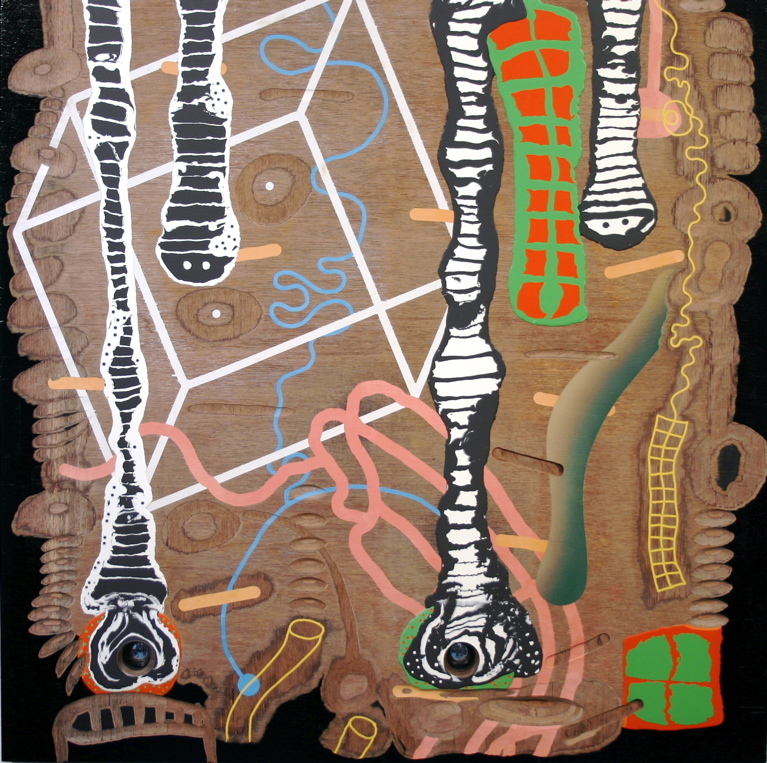 The insistant narrativisation of the making process – of the works becoming – as against simplistic forms of representation or the mere presentation of information. The conflict between repetition and singularity. The tension between the inscriptive order of language and its blank ‘other’ – the mental space that must be made to persist… despite the inrush of information… if inscription is to remain a compelling index of human presence. Where these seemingly irresolvable dualities are concerned, the complex narrativisation of process and the humanistic ‘doubling’ in Taborn’s work, seems to offer some kind of curative resistance to information overload similar to that proposed by Walter Benjamin in his Illuminations: When information supplants the old form, storytelling, and when it (information), in its turn, is made to give way to sensation it reflects upon an imaginary degradation of human experience… Now the traces of the storyteller cling in the way that the hand prints of the potter cling to the clay vessel.